Q : What is Moringa ? A : Imagine if you will, a tree so full of nutrients, it can rebuild weak bones, enrich anemic blood and even enable a malnourished mother to nurse her starving baby. Imagine if there was a tree that can purify dirty water, can treat diabetes and control high blood pressure. Imagine if this same tree is drought-resistant and can grow under harsh conditions in countries suffering from poverty and hunger...wow what's that? There is such a tree…it’s called Moringa, known also as The Miracle Tree. There are 13 varieties of Moringa, Moringa Oleifera is the most well known. Every part of this tree is edible, from the leaves, trunks, stems, all the way down to its root. The flowers can be eaten or used to make tea and provide good amounts of both calcium and potassium. The young pods can be cooked and reportedly have a taste reminiscent of asparagus. The green peas and surrounding white material can be removed from larger pods and cooked in various ways. Moringa trees have great potential in combating extreme poverty and hunger. The nutritious leaves grow quickly, in many different environment types, and can feed people, as well as livestock and sanctuary animals. Surprisingly, the leaves contain complete proteins, which is rare for a plant. And in many developing countries, Moringa is used as a micro nutrient powder to aid indigenous diseases. Q : What nutritional value does the Moringa tree have? A : One of the most nutritious plants on the planet, Moringa contains four times as much vitamin A as carrots; three times as much potassium as bananas; and seven times as much vitamin C as oranges. It also has four times as much calcium as milk for strong bones and teeth and as much protein as eggs to build muscle. The richest source of beta-carotene among all leafy vegetables, Moringa has three times the iron of spinach. Moringa can rebuild weak bones, enrich anemic blood and provide enough nutrition to enable a malnourished mother to nurse her starving baby. Q : What is the difference between Moringa’s natural nutrients compared with manufactured supplements? A : Studies have shown that less than 10% of manufactured vitamin and mineral supplements are actually absorbed by the body. With the exception of common table salt, the body treats these isolated minerals like foreign substances, and nutritional absorption is limited. Studies confirm that minerals in their natural state deliver much more nutrition than synthesised supplements. Q : Is Moringa dried leaf more potent than fresh Moringa leaf? A : Scientific research has shown that after the Moringa leaf is carefully shade dried it contains significantly higher amounts of nutrients. Q : Do the Moringa leaves lose any of their nutrients during the drying process? A : No, our Moringa leaves products are carefully dried in the shade to ensure the valuable nutrients are not lost. Q : How do I use Moringa leaf powder? A : Moringa leaf powder can be used as a tea, added to beverages, sprinkled on food or taken in capsules. It can be used in cooking, but high temperatures destroy some of the nutrients. Q : When is the best time to take Moringa capsules? A : Due to Moringa’s ability to increase energy, it is recommended to take two Moringa capsules in the morning after your breakfast,if you want to boost your cheerfulness then four capsules is your option. Anyhow do not forget to take two capsules after each meal of a day. Q : How long does it take to feel a difference? A : We have had many people notice a positive difference from taking our Moringa capsules within 10 days. However, please remember that everybody will respond differently to unique natural blend of nutrients. Q : What scientific studies support Moringa? Q : Is Moringa safe to take during pregnancy? A : In many parts of the world Moringa is distributed to pregnant and lactating women to provide nutrition and improve milk production and is called “Mother’s Best Friend”. If pregnant or lactating, we recommend consulting your doctor before taking Moringa and not taking more than two capsules per day. Q : Are Moringa capsules safe to take with medications? A : Moringa leaves have not been found to be toxic. Very extensive health and safety studies conducted at the Noguchi Memorial Medical Research Centre in Ghana determined that Moringa leaf powder has no toxic elements. Absolutely no adverse side effects from even the most concentrated Moringa diet were observed. Anyhow,please consult your doctor if you have any health concerns. Q : Is Moringa Oleifera GM (genetically modified)? A : No,our Moringa is not genetically modified (GM). Q : Are Moringa capsules organic? 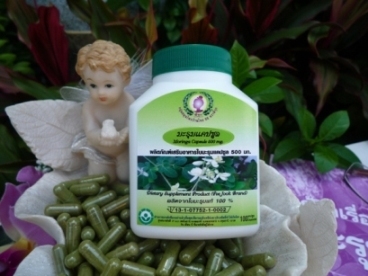 A : Yes, every Moringa-based products from Thai Herbal Group is organically grown. Q : Are Moringa capsules suitable for diabetics? A : Yes,they are suitable for diabetics. Moringa provides the body with long-lasting energy without hyperactivity or the energy low associated with sugar based foods. Q : Are Moringa capsules suitable for suffers of lactose intolerance? A : Yes. Despite containing 16x the calcium of milk, Moringa does not contain any lactose. Q : Are there any side effects? A : Some may initially experience a slight upset stomach or nausea due to Moringa detoxification effect. If that occurs, we recommend to stop for 3-4 days then start taking one capsule per day for one week, until the detoxification side effects subside. Please consult your doctor if you have health concerns. Q : What are the specific ingredients of your Moringa capsules? A : The specific ingredients of Moringa capsules made by Thai Herbal Group are 100% of Moringa oleifera dried leaves powder.We do not mix our Moringa leaves powder with any other parts of Moringa tree i.e. stem bark,root and or seed.All vitamins, minerals and amino acids are naturally occurring in every capsule. Q : What is the shelf life of Moringa capsules? A : A shelf life of our Moringa capsules are up to two years is expected, although we recommend taking 2 capsules/3times a day for optimum benefits. Q : Where Can I Find Moringa?